The diversity and options that can be found in this part of the world are almost unimaginable. All of the following areas offer incredible opportunities to see nature at is best! Alley – So appreciate your posts and information. I am trying to plan a bday trip for my husband from 2/20 -2/22 between the Grand Canyon, Sedona and now Page with all the awesome options I am seeing. I planned a helicopter trip over the Grand Canyon for the morning of 2/20 and think I would like to head to Page after that. With the late afternoon of 2/20 arriving into Page. What would you recommend as the best spots to visit and the timing of hitting those spots. We are pretty flexible for 2/20 afternoon and all day 2/21 & 2/22. Hello Jane, and thank you for visiting our site! The trip from Grand Canyon South Rim to Page, AZ, is ~150 miles, and takes about 2.5 hours – if you drive direct and don’t make any stops. That rarely happens as the drive is very scenic and you’ll no doubt find yourself stopping to take pictures at the 6+ named overlooks of the Grand Canyon you’ll pass on the way to Desert View Point, the Little Colorado River Overlook, the Cameron Trading Post, Chinle formation/”badlands” views, and The “Cut” Overlook… just to name a few 😉 In light of all this, 3.5-4 hours ends up being a more accurate figure. However, you want to be sure to time any drives you make so that you’re at your destination prior to sunset. Nighttime driving is strongly discouraged in this part of the US due to lack of ambient lighting on local roadways, plus the possible presence of deer, elk, coyotes, free range cattle, and other wildlife. Daylength in February is relatively short: sunrise occurs at about 7:15 AM, and sunset takes place shortly after 6:00 PM. Timing and parking permitting, you could hit the Horseshoe Bend Overlook on the way into Page. It’s located a few miles South of town, so it’s right on your way. However, this is a very popular spot for sunset, so you might find the parking lot already full. If that’s the case, plan on going back the next morning, just after sunrise. The views are just as pretty, and there tends to be fewer people to contend with. The next day, plan on touring Antelope Canyon. If you can grab a mid-day spot, that’s generally regarded as the best time for lighting in the canyon. If these spots are already full, which is entirely possible at this point, then go whenever there’s space available that fits your schedule. If you’d rather not mess with all that, you might also consider touring one of several “alternate” slot canyons that are just as beautiful, but far less crowded. As for other things you might do, water-based activities such as Lake Powell Boat Tours and the Glen Canyon Float Trip are on seasonal hiatus. If you have another full day to work with, I’d suggest doing a tour to White Pocket or maybe Alstrom Point. 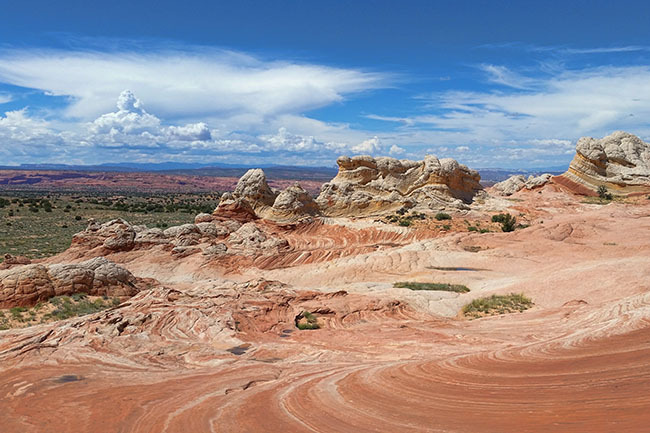 White Pocket is an area in the Vermilion Cliffs/Paria Canyon Wilderness renowned for its amazing rock formations, and the fact that you don’t need a permit (yet, knock on wood) to visit it. Tours to this area are offered by several companies. The ones we’re most familiar with are Paria Outpost & Outfitters (located between Page, AZ and Kanab, UT) and Vermilion Adventures, which is a division of Roger Ekis’ Antelope Canyon Tours, located in Page, AZ. For Alstrom Point, we recommend Alstrom Point Tours, a division of Horseshoe Bend Slot Canyon Tours, also located in Page, AZ. On the above list I have already been to Bryce Canyon and Zion. Are there any of the others you can recommend that does not entail too much walking? My days of doing that are over but I would like to see more sites. I would just rather drive to these places and get out and walk some if I have to. Fortunately you’ll find lots of parks and other attractions in the Southwest where you can keep exertion to a minimum if needed. The most notable entrant: Grand Canyon South Rim. It is very easy to tour using your own vehicle on the East Rim/Desert View Drive and the free shuttles out to the Hermit’s Rest/West Rim overlooks. Sedona and the surrounding area can also be enjoyed by car, with the backcountry areas accessible by jeep tour. In Page, AZ, Upper Antelope Canyon is one of the most, if not THE most accessible attraction in the area at just 100 yards in length, with a flat trail out and back. Horseshoe Bend is another must-do attraction in the Page, AZ, area, but the walk can be a challenge for some. If you think you might fit into this category, there are alternate means of seeing Horseshoe Bend, such as flying over it, or taking a shuttle to the Navajo Reservation entrance, that will eliminate much, if not all of the need for strenuous walking.